Well hello! Hope you all had a pleasant Memorial Day weekend. The huz and I just got back from a mini weekend getaway in Chicago. We had a wonderful time, and, as always, I have plenty of photos to share from our trip, including some amazing dining experiences. Friday morning we boarded the Megabus in Ann Arbor, bound for Chicago. This was our first experience on the Megabus. I’d say our experience was more or less positive – no real snafus, and the company delivered on what was promised – getting us to our destination, Chicago, on time, with no muss, no fuss. We were a little disappointed to not be able to sit by one another on the crowded bus (and I was even more disappointed to sit by some punk kid BLARING Disturbed on his headphones for the entire 4+ hour journey – he’ll be half-deaf by 30, amirite? ), but all-in-all, the experience was fine, and an affordable way to travel to Chicago without having to buy gas or deal with parking in the city. Our first dining experience of the trip probably doesn’t fall into the “amazing” category, but it nonetheless provided indulgent sustenance to keep us going until we arrived at our destination. 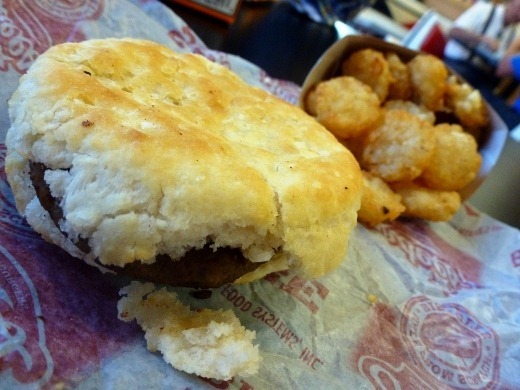 About one hour into our trip, the Megabus made it’s one and only rest stop, for 30 minutes, at Love’s, in which there was also a Hardee’s where we had a small breakfast – sausage biscuit with hash rounds. 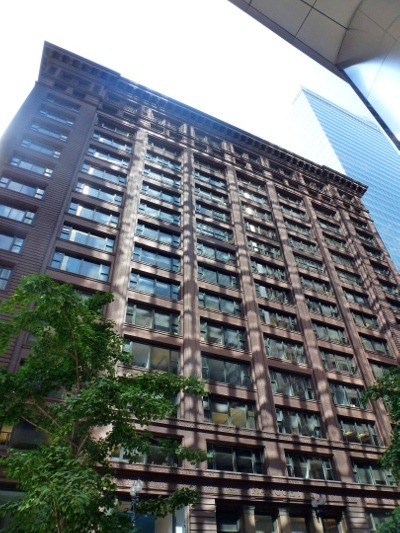 Once we arrived at Union Station in Chicago, we walked just under a mile to our hotel, The Silversmith Hotel & Suites, which was located on South Wabash Avenue. The location was AMAZING for us. 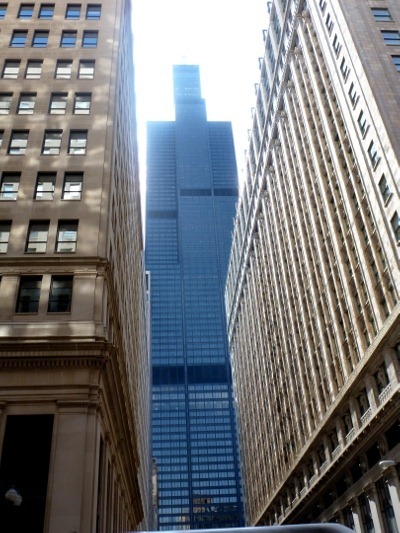 We were only a couple of blocks from Millenium Park, the Magnificent Mile,The Art Institute, and so much more. We walked, exclusively, to everything during our stay in Chicago, which was wonderful. 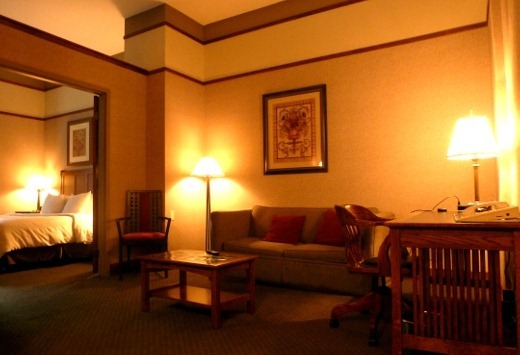 I found a good rate for this hotel on Expedia, which is where I booked our stay. 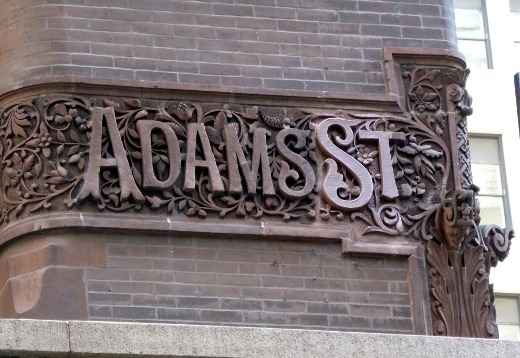 The entrance to our hotel, as mentioned, was on South Wabash Avenue. The noisy public transit system also runs down Wabash, and I was a bit worried our room might be loud, but after checking in, our room was very quiet. We stayed in an interior room on the fourth level. Let me give you a tour. 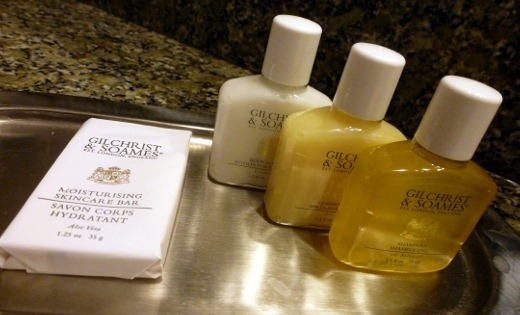 We were most pleasantly surprised upon entering our room! 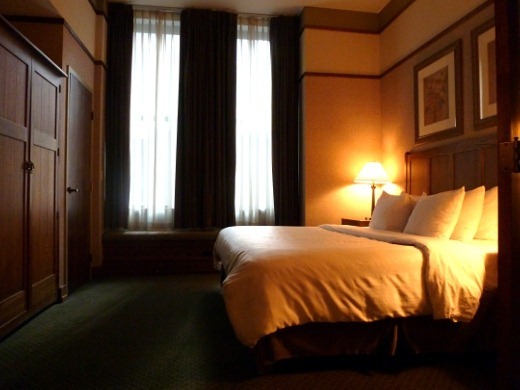 It was a very spacious room, and so warm and inviting. The finishes weren’t necessarily the most modern, but everything was clean and in very good condition. Our sitting area was separated from the bedroom by double doors. 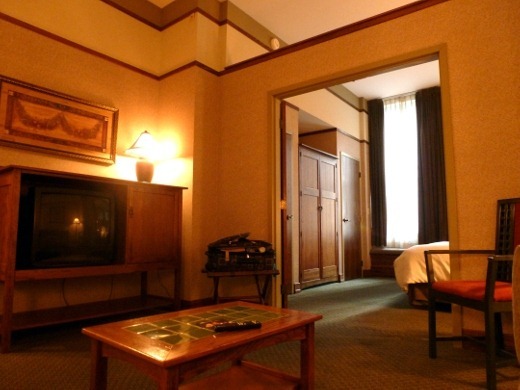 The room also had two TVs – one in the bedroom, and one in the sitting area. The room had many of my favorite hotel amenities: a mini fridge, two closets and a luggage tray, a separate sitting area and desk, and lots of easily accessible outlets for charting my electronics. There was also a padded bench along the window for additional seating. 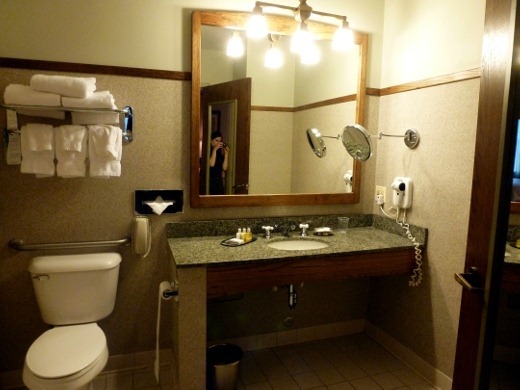 My favorite hotel amenity: a make-up mirror with a built-in light! Whenever I find this in a hotel I am delighted. 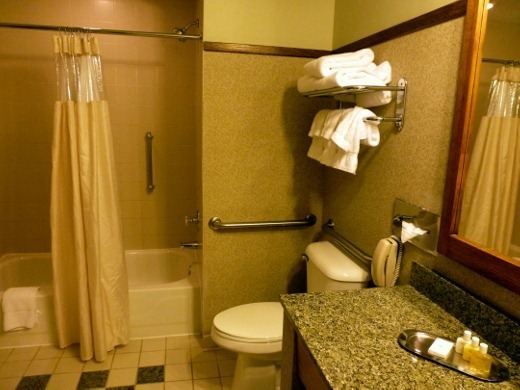 The bathroom was also very large for a hotel bathroom, and featured granite countertops. 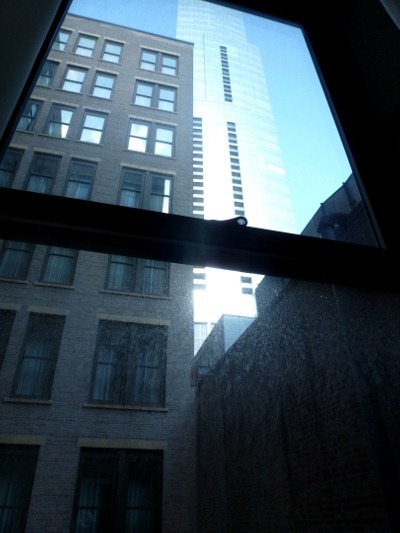 My only real critique of the room was that it slightly lacked natural light during the day, probably because of our fourth floor room’s proximity in the building, and the fact that we only had two narrow windows in our spacious room. However, the lack of natural light was remedied by an abundance of lamps throughout the room that provided a warm, cozy light. 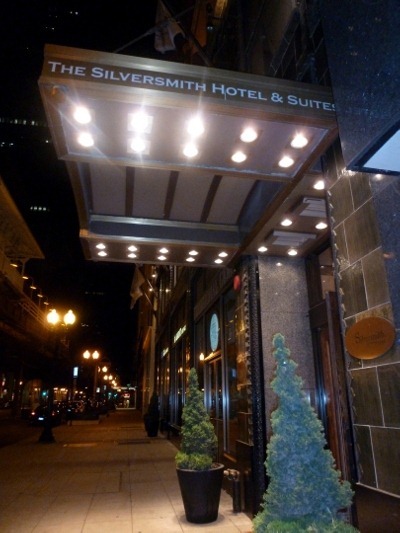 In conclusion, The Silversmith Hotel & Suites served us very well during our three night stay in Chicago! 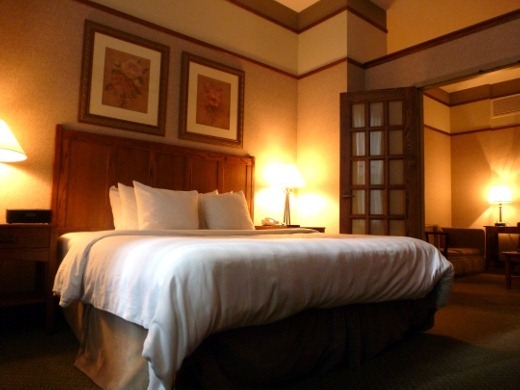 The location is ideal, the staff members are courteous and kind, and the rooms are spacious, warm and inviting, and clean. I would highly recommend this hotel to anyone! After checking into our hotel, we grabbed lunch at Corner Bakery, down the street. 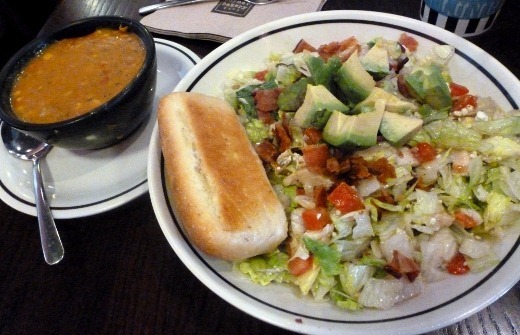 Poblano Corn Chowder and a Chopped Salad for me. 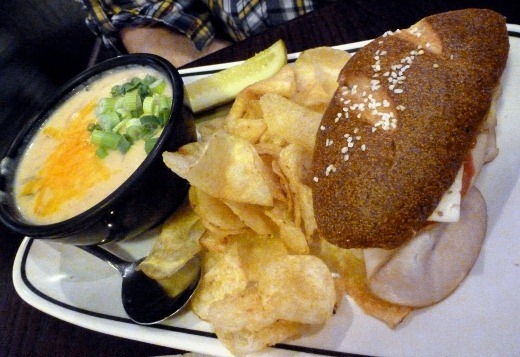 ..And a turkey sandwich on a pretzel bun with loaded potato soup for him. Only a couple blocks away was the Chicago Architecture Foundation, where we met up with our tour group for a two hour walking tour chronicling the rise of the Chicago skyscraper. 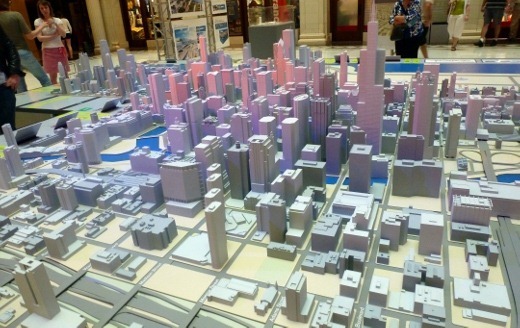 In the lobby, was a 3D model of Chicago which was fun to explore. 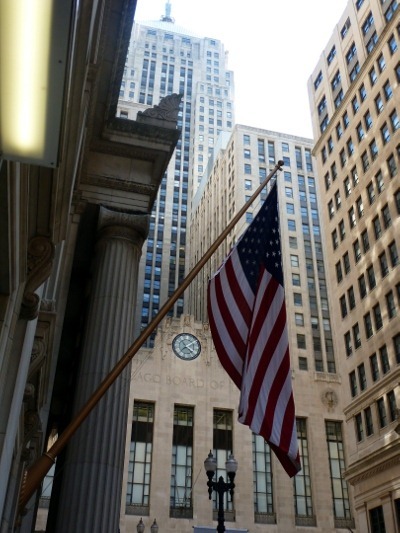 During our walking tour, we learned about Chicago’s history as the birthplace of the skyscraper, and focused on buildings from the later 1800s through 1930, or so. Our docent, Larry, was extremely knowledgeable and led our group at a brisk pace, allowing us to cover as much ground as possible during our two hour tour. 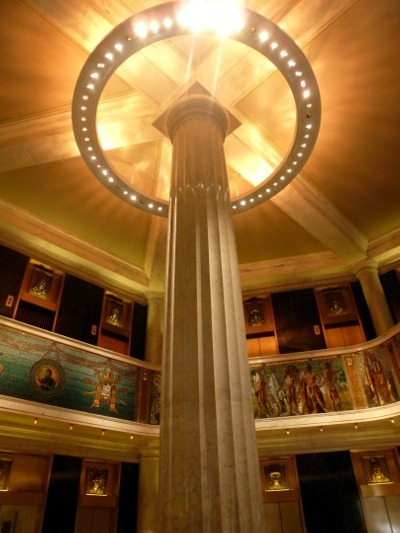 Not only did we view the building facades, but we also had the opportunity to visit the lobbies of most of the buildings, many of which were quite spectacular. 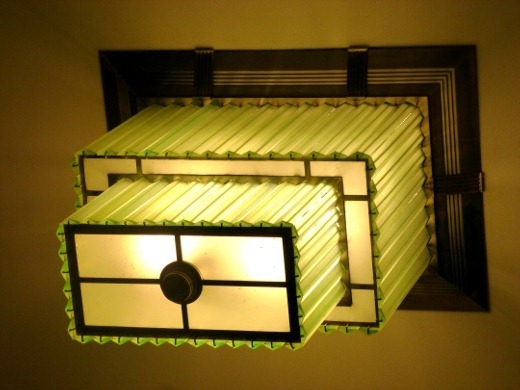 Chicago School and Art Deco were two of the primary architecture styles in which buildings of this era were designed. 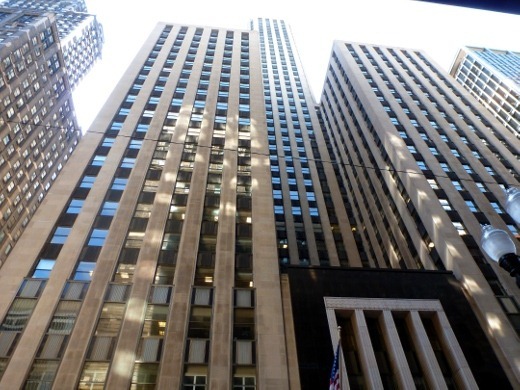 The below building features classic art deco, with an emphasis on verticality, and the set-back in the middle of the building enhances air flow and lighting in the interior offices. 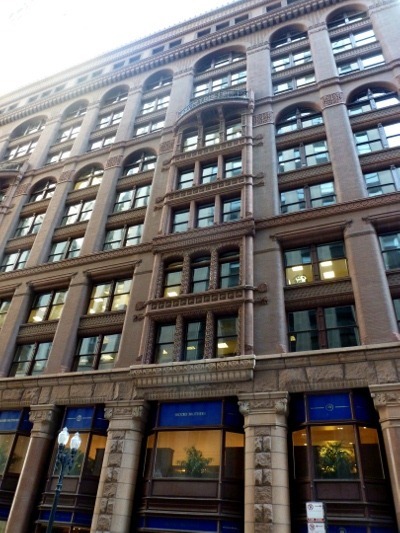 Correct me if I am wrong, but this building is known as The Rookery, and features Chicago School-style architecture. 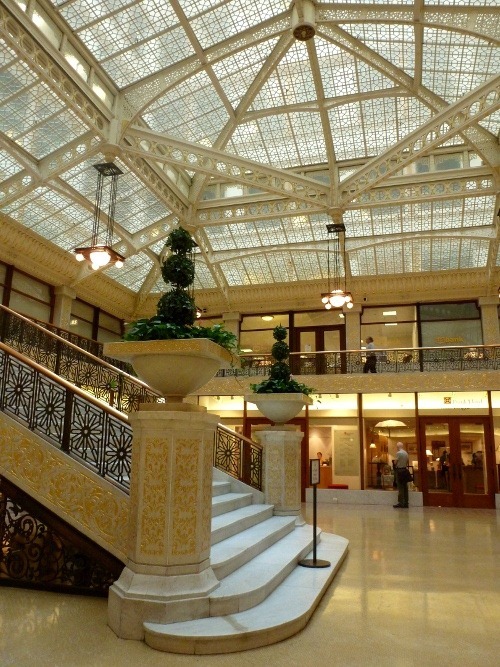 The dramatic, and beautiful lobby of the Rookery, decorated and designed by Frank Lloyd Wright. 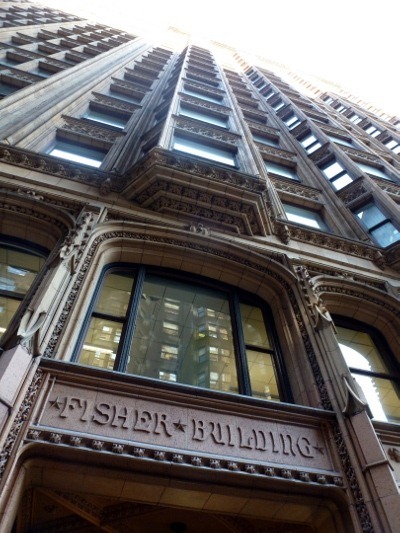 The Fisher Building was ornate and attractive. After our walking tour, we went back to our hotel to rest of feet, and get ready for dinner, which I will tell you about in my next post! Pingback: Chicago Getaway–Day 1, Part 2 « Meg.Goes.Nom.Nom. Pingback: Chicago Getaway–Day 2, Part 1; Taste of Chicago Tour « Meg.Goes.Nom.Nom.